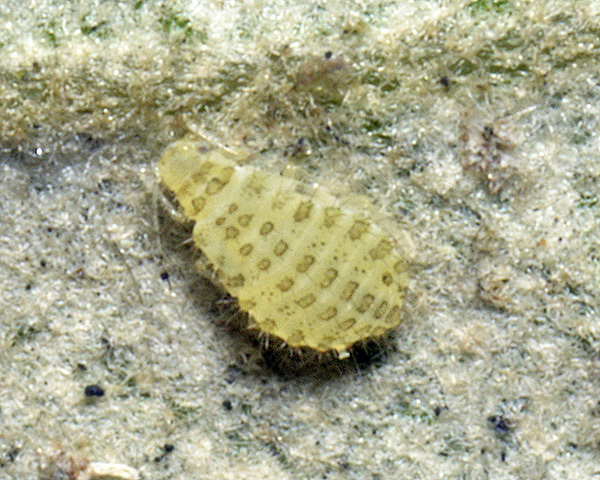 Hoplocallis are small aphids related to Myzocallis. All adult viviparae are winged. 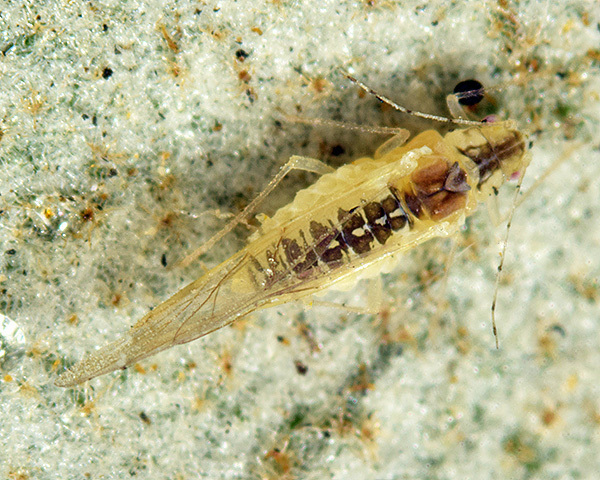 Unlike Myzocallis aphids the antennal terminal process is always shorter than the base of the sixth antennal segment. Also the head and prothorax have a median longitudinal pale stripe extending backward from the median ocellus between bands of pigment. The pronotum has anterior and posterior spinal and marginal clusters of small hairs. The abdomen has paired dark spinal sclerites that are fused posteriorly across midline on some or all of the tergites. There are four Hoplocallis species in Europe and Asia which all feed on oak (Quercus). The winged adults of Hoplocallis picta (see first picture below) are rather elongate and are pale yellow-green. They have banded antennae and the abdomen has a series of dark spinal markings with pale centres. The ratio of the length of the antennal terminal process to the base of that segment is 0.5 to 0.8. The third antennal segment has 2-4 secondary rhinaria. The body length of Hoplocallis picta is 1.8-2.1 mm. Immature Hoplocallis picta (see second picture above) are broader and flatter than adult alates and have four longitudinal rows of pale-centred brown sclerites bearing clusters of hairs. Hoplocallis picta feeds on the undersides of oak (Quercus) leaves in Mediterranean Europe eastwards to south west Asia and India. In Europe it has been extending its range northwards into Britain, where it has been found feeding on holm oak (Quercus ilex). Our observations are the second record of Hoplocallis picta in UK to date.